Anyone fancy a game of catch-up? An image shows how the new look Queensgate shopping centre should appear to shoppers. 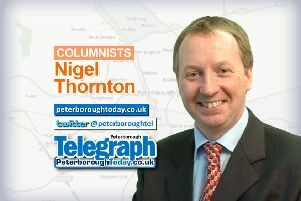 Over the last few years Peterborough has often hit the headlines for all the wrong reasons - Immigration, child grooming and inadequate social care are just three that spring to mind without me having to tax my brain too much. It seems we are Nigel Farage’s city of choice when it comes to easy platitudes on any given migration issue, although recently he has been too busy playing UKIP hokey cokey to care – In, out, in, out, shake it all about. In tough economic times bad headlines for a city like ours are about as welcome as weekly correspondence from Prince Charles but we have also had our fair share of positive ones down the years, moments when Peterborough has been well and truly put on the map for all the right reasons. One of those was at Wembley in 1992 when Chris Turner led Halsall, Charlery and Ebdon, et al, to unlikely glory and a place in the second tier of English football for the very first time. Last Friday I was honoured to stand alongside eight or nine hundred others in Peterborough Cathedral to say a fitting goodbye, to a very special man, a man who gave so much to this city - A friend to you, me and anyone who knew him. Ten years before Turner’s Roy of the Rovers exploits at the twin towers, it was news of a new shopping centre that was splashed across the front pages, a centre that made us the envy of the midlands. When Queen Beatrix of the Netherlands cut the ribbon back in 1982, the Queensgate shopping centre was cutting edge and became an instant hit with shoppers from far and wide. Since then successive owners have failed to invest and the centre has become tired and jaded, with shoppers heading instead to shinier, newer offerings in Leicester, Milton Keynes and beyond. The new owners are promising a thirty million pound re-invigoration which will deliver new shops, restaurants and a multi screen, IMAX cinema – Won’t it be nice to sit in a cinema for a change where your feet don’t stick to the floor and where Ronnie Corbett is not blocking your view in the seat in front of you? Once this and the North Westgate development are finalised the city should once again provide an enticing offer (although how we can support two city centre cinemas is beyond me). Unfortunately by the time we have finished playing catch up, other places in the region may have already stolen a march. It will take big ideas and inspirational leadership to keep Peterborough ahead of the game and enable it to realise its potential as a great city. The question is – Who will provide it?